Add the finishing touches to your bedroom with this beautiful bedside table. It features a pull out tray above a single drawer. The drawer is available with optional "soft close" drawer guides. Store all your bedtime necessities in this nightstand and pull out the tray for a glass of water or book while lying in bed. 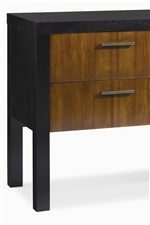 The Milan Bedside Table by Century at AHFA in the area. Product availability may vary. Contact us for the most current availability on this product. The Milan collection is a great option if you are looking for Contemporary furniture in the area. 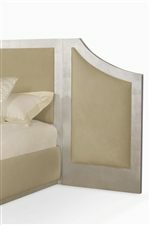 Graceful Upholstered Side Wings are Bordered in Short-Grain Satin Walnut Veneer. Solid American Walnut On Square Legs. Browse other items in the Milan collection from AHFA in the area.